The sun just rose on the fifth day a presidential election is scheduled to be held in the Maldives in just over two months. On 7 September 2013, over 200,000 people, 88% of eligible voters, cast their votes. 45.5% (95,224 people) voted for MDP candidate Mohamed Nasheed, 25.35% (53,099 people) voted for PPM’s Yameen Abdul Gayoom, 24.35% (50,422 people) for JP’s Qasim Ibrahim and 5% (10,750 people) for Mohamed Waheed Hassan Manik. The second round, scheduled for 28 September was first postponed, then annulled by the Supreme Court on 7 October in a case submitted by JP and supported by PPM. All attempts to hold the election on that day were stopped by the security forces, as ordered by the Supreme Court. A second first round was scheduled for 19 October according to new elections Guidelines by the Supreme Court. Despite all preparations in place, PPM and JP candidates refused to sign the voters registry, switched their phones off and went into hiding. 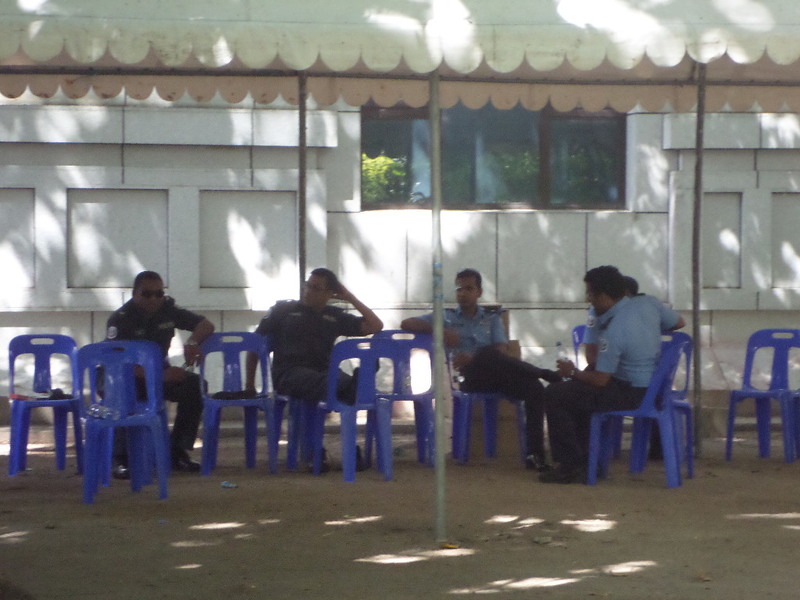 Maldives Police Service refused to provide the necessary protection to the ballot boxes in a move that breached their oath and the Maldivian Constitution. Amid condemnation from the Human Rights Commission, the Police Integrity Commission investigated police actions and held a lone policeman responsible for obstructing the entire election. Elections Commission set a new date – 9 November. And, if necessary, a second round on 16 November, today. There were many attempts to obstruct the 9 November election too. In the two weeks that Elections Commission chief Fuwad Thowfeek and his team needed to prepare all over again, both PPM and JP came up with several reasons for which they could exercise their Supreme Court-given power to veto the election: re-registration process was too lax, fingerprints were not taken properly, fingerprints needed verification. In the end they buckled under pressure from the international community—serious threats were made, reports say, of sanctions from the UK, United States, EU and other democratic actors—and agreed to hold the election. There was also intense domestic pressure. According to the Constitution, a new leader should be elected at least 30 days before the end of a current presidential term and the new president must be sworn in on the last day of the term. With the uncertainty over elections, the People’s Majlis passed a resolution to install Speaker Abdulla Shahid as President, with all powers assigned to the office if there was no elected leader by midnight on 10 November. Combined with the international pressure, the Majlis resolution galvanised PPM and JP into attempting to bring the election forward to 2nd November. The Elections Commission refused, but agreed this week to bring the second round forward to 10 November if one was necessary. The first round went ahead as scheduled on 9 November. Mohamed Nasheed got 46.93% (96,764) votes, Abdulla Yameen 29.72% (61,278) and Qasim Ibrahim 23.35% (48,131) votes. Despite the chaos and unrest in the two months since the first first round there was only a small reduction in voter turnout. On 7 September, out of 239,593 eligible voters 211,890 ( 88.4%) voted. On 9 November out of 239,105 eligible voters, 208,504 (87.2%) voted registering a 1.2% drop. Between the results being announced and the second round scheduled for the 11th, there were only a few hours. At 5:30 in the morning the Supreme Court published a new ‘ruling’ on its website. The document was written on official paper but carried no signatures. 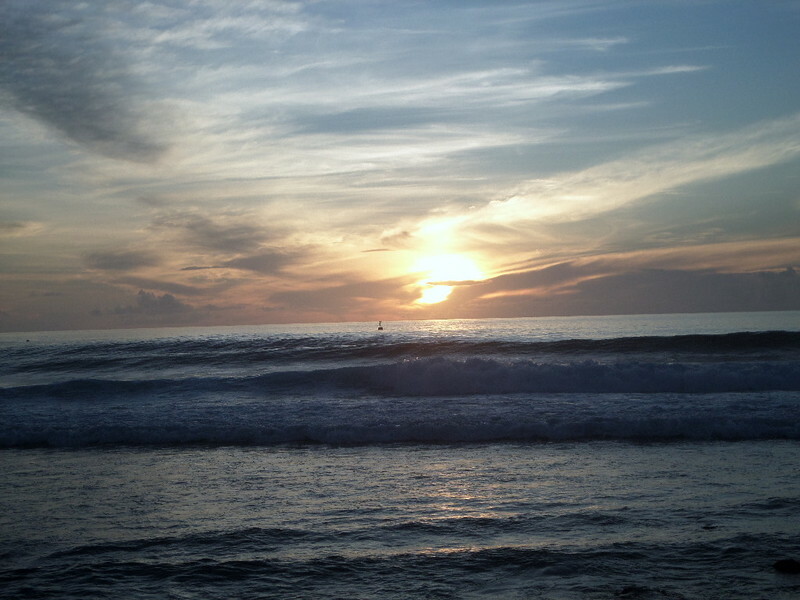 It forbad the second round on the 11th and ordered that it be held today. On 10 November, less than half an hour before midnight, Dr Waheed who dropped out of the race with only ten thousand supporters and no running mate, appeared on national television to say he was staying on beyond the presidential term. He refused to accept the Majlis ruling to install Speaker Shahid as President, criticised the Majlis for not amending the Constitution to allow him to stay, and said he will follow the illegal ruling of the SC instead which overruled the Majlis resolution. On the morning of the 11th, the Chief Justice refused to administer the oath to Speaker Shahid, ensuring the Majlis resolution could not be enforced. On 14 November, while PPM and MDP were separately gathered on the eastern side of Male’, Waheed quit and left for Macau with a suitcase packed with MVR500,000 and a wife who is said to be needing surgery. Before that, on the same afternoon, after pretending for a day to be considering endorsing Nasheed, Qasim Ibrahim went with PPM, forming an Anyone But Nasheed alliance with PPM, Adhaalath and some others. Both sides held their last rallies yesterday afternoon. Mohamed Nasheed and MDP were on foot walking and dancing, Yameen and his new ‘Together’ PPM alliance of leaders and supporters were on small trucks waving from behind large pink balloons. All the campaigning is now over. Male’ hasn’t fully woken up yet, but it will soon. In one hour from now (7:30 a.m.), polling booths will open. It is hard to predict what the day will bring, what the results would be, or what would follow the results. At the end of today who will be the new President of the Maldives? 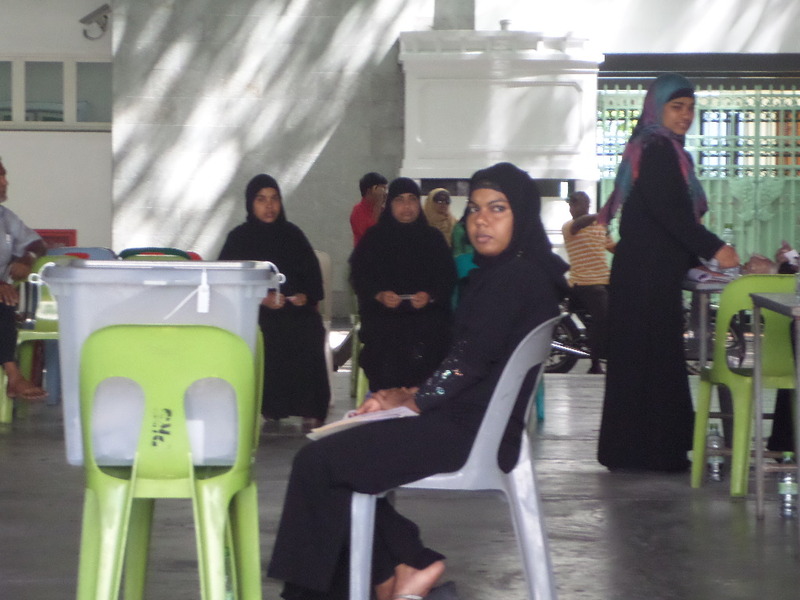 Will Maldives vote to restore democracy or for a return to dictatorship? 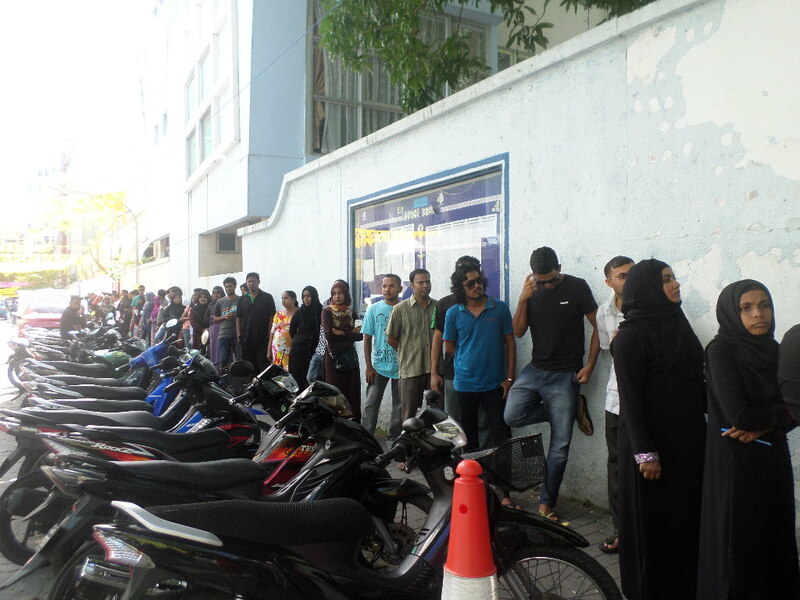 8:33 am Queueing to vote in South Henveiru T03.1.1. 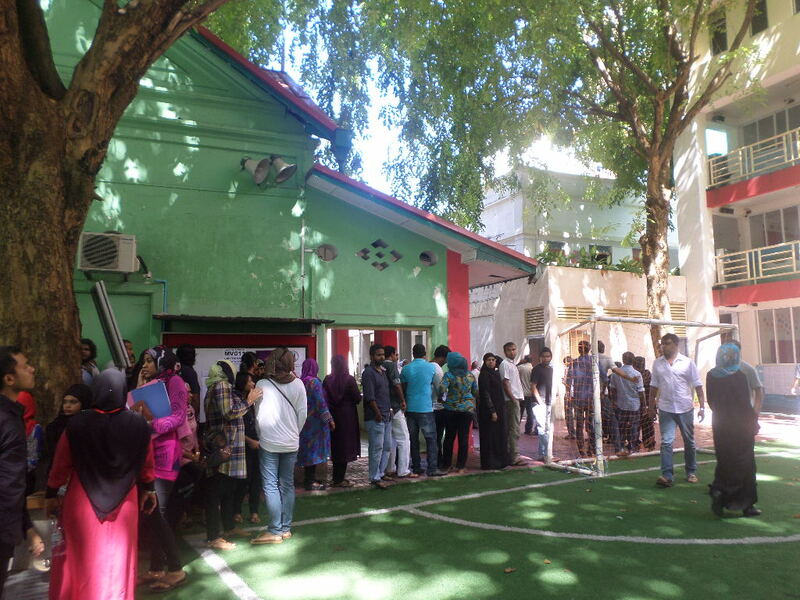 People began queuing shortly after sunset at polling booths all over Male’ and leave with a proud smile once they’ve voted. I waited 45 minutes to vote. 11:00 am Voting continues in Male’. 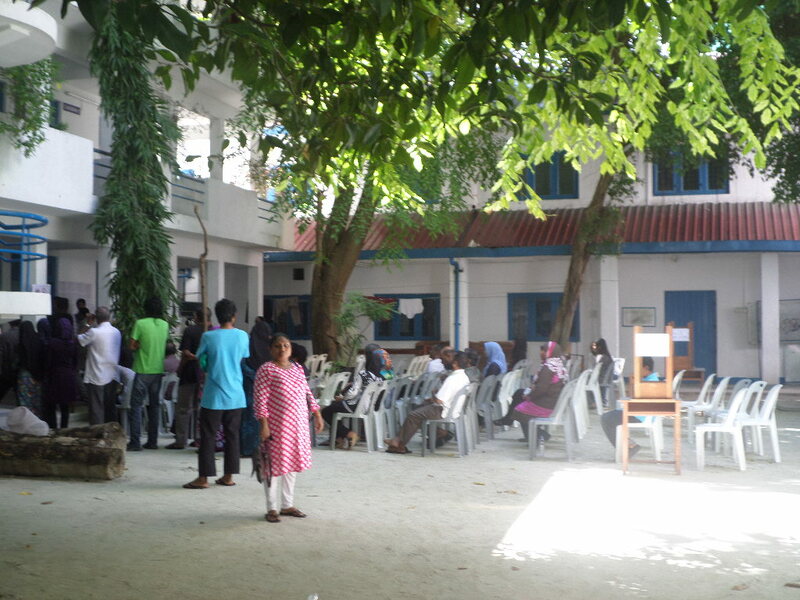 The busiest polling station this morning is Majeediyya School, where Addu City’s Male’ vote boxes are. 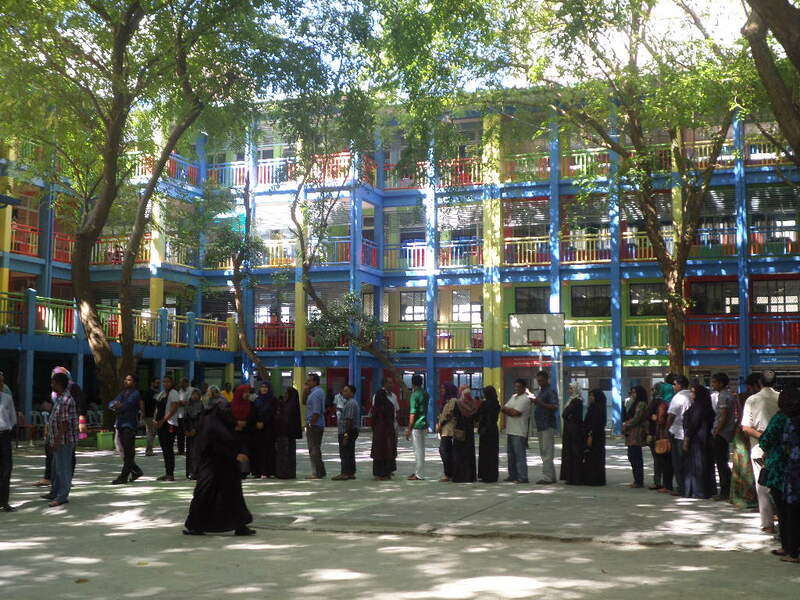 Queues in Dharumavantha School on the other side of Majeediyya are just as long, and orderly. Inside Dharumavantha School is like a haven from the blistering heat outside. Voters wait patiently for their turn under the tall trees. 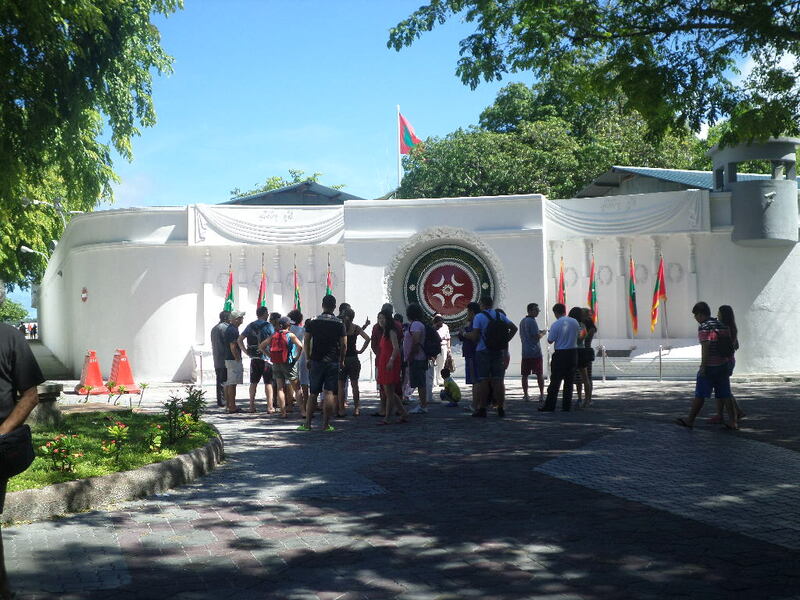 This is the polling booth for people of Lhaviyani Atoll in Male’. 11:14 am This time of the morning, there aren’t too many people at the Huravee Building booth. Slow and steady. 11:23 am Mohamed Nasheed just voted in CHSE reports CNM. 11:56 am Yameen’s PPM has given a press conference to say they are not happy with quality of the ballot paper. Not enough security features, it seems. 2:46 pm Crowds are now thinning near most ballot boxes, reports Raajje TV. Maldivians have a habit of waiting until the last minute for everything, so a surge in the next hour is very likely. 2:48 pm Get your dancing shoes on. Male’ City Council told Raajje TV just now that people do not need permission to party for 24 hours when the election results come in. 2:51 pm Gasim Ibrahim, the candidate who lost in the first round and had it annulled voted a few minutes ago. 2:53 pm Male’ City Council may have given permission to party for 24 hours, but in this constitutional vacuum, there’s no authority to say whether tomorrow is a holiday or not. 3:13 pm Parliament is preparing the oath taking ceremonies for the new President and Vice President tomorrow. It is still not known whether tomorrow will be declared a public holiday. 3:16 pm Lots of reports coming in of police detaining voters for displaying their ballot papers after ticking them. Is this a new way of invalidating ballots? 3:26 pm Elections Commission holding a press conference. All vote boxes, except the one in London will close at 4:00 pm. 3:27 pm Some people [PPM] have raised questions about quality of paper used for ballots. Fuwad Thowfeek insists paper is of higher than normal quality. Regarding complaints about security features, Fuwad Thowfeek says they are fully integrated into the paper, and may not be obvious to the naked eye. 3:28 pm There are security features on the ballot papers. Of course, I won’t be revealing what and where – for security reasons. Fuwad Thowfeek continuing to answer PPM’s recent complaints. 3:34 pm Talk about the indelible ink being easy to wash off is not true, Fuwad says. ‘I have tried to wash mine off, have even used soap, but the ink is still here’, he says. 3:35 pm Elections Commission says that most complaints are coming in because people have been stopped from voting because their addresses on ID card and DNR database do not match. There are also complaints about campaigning and anti-campaigning as well as of people displaying their ballot papers. 3:42 pm Just because the ballot papers are printed in black and white does not mean they lack security features – Manik, Elections Commission. 3:46 pm We can give you 100 percent guarantee that we will not be counting any ballot papers that are not authentic – Fuwad Thowfeek. 3:47 pm Votes of those who display their ballot papers will remain valid, but steps will be taken against the voter who made the display. 3:52 pm Police have announced that they are taking statements from the voters displaying their ballot papers and releasing them. 3:57 pm If someone’s name is not on the Voter Registry, even if by our negligence, the person cannot vote anymore. This is a result of the Supreme Court guidelines. 4:00 pm Polling booths close across the country and abroad. Only one remaining open is London which will close at 10:30 p.m. Maldivian time. People already in the queue at their designated ballot boxes will be allowed to vote. Fuwad Thowfeek says all results except London’s will be in by about 10:30-11:00 pm tonight. Provisional result can be announced by midnight tonight and the official result tomorrow morning. 4:15 pm Chief Elections Commissioner Fuwad Thowfeek forced to spend precious time talking about weight of ballot paper and explaining that black and white print does not mean ‘low quality’. All ‘issues’ rising from PPM’s complaints earlier in the day. 4:40 pm Counting begins, and so does the anxious waiting. Streets of Male’ are busy with people finishing up work and heading for black tea or coffee to wait with friends https://twitter.com/Velezinee/statuses/401681082619133952. 43 box counted, 432 remaining. Total 7,750. Time: 5:09pm. 95 box counted, 380 remaining. Total 23,211. Time: 5:19pm. 6:32 pm PPM has majority in 16 atolls, says Raajje TV. 6:35 pm Tomorrow is not a holiday, the President’s Office has said. Business as usual. 6:38 pm RTV has counted 61.33% of the vote. Here’s the result: Nasheed 48.54 Yameen 51.46. 7:23 pm Yameen is still leading 51.28% to 48.75%, says Raajje TV. 10:36 pm MDP has just begun a meeting of the party’s National Council. Mohamed Nasheed is expected to hold a press briefing. 10:37 pm There are so many leaders in the Together Coalition, even they don’t know each other’s names. 22:53 pm Yameen gets the opportunity to speak at last. 23:03 pm Yameen says he could not have done it without the country’s youth, and says he will focus on finding a better life for them. PPM will remember people who do what they want and reward them for it, he says. 23:11 pm Nasheed has thanked the Elections Commission for their contribution to democracy consolidation in Maldives. 23:14 pm It is too early to say whether I would run in 2018 or not. Even if I want to do it, it will depend on what MDP wants and also the timing, Nasheed tells the media. 00:15 Inauguration of the new President Abdulla Yameen and Vice President Mohamed Jameel Ahmed will be held tomorrow (Sunday) morning in the Parliament at 10: 30 am. Mohamed Waheed Hassan Manik has fled the Maldives with MVR500,000 in cash and no dignity. Last night, at around 10:30 p.m., while opposing candidates and their supporters were busy holding their last campaign rallies ahead of tomorrow’s vote, Waheed hastily got into a speedboat waiting at the jetty straight in front of his Office and beat a retreat. Dr Manik, was the Vice President in the first democratically elected government of the Maldives but betrayed President Mohamed Nasheed on 7 February 2012 as the facade that portrayed the day’s coup as ‘a legitimate transfer of power’. He ran for President in September this year but managed to garner only 5% of the vote. He remained as ‘President’ for 21 months, the last three days of which were beyond the presidential term he illegally occupied. He recorded a ‘farewell speech’ aired this morning on all television channels some 12 hours after his departure. He spent his last words on defending his decision to side with the coup-makers—‘I was treated very badly as a VP!’; on insisting that Supreme Court is the final authority on the Constitution—‘we have to obey the Supreme Court, no matter what!’; on boasting about how he maintained peace and stability in the Maldives—‘I did that under so many difficulties!’; and on praising the security forces for their ‘defence of Maldives and our people.’ He sounded bitter, and was determined, even at the last minute, to attack his former President. While hiding in whatever glorious mansion of Macau that he is in, he told anyone watching Maldivian television that Nasheed had ordered the military to use rubber bullets against the mutinying police on 7 February. Retired Brigadier General Ibrahim Didi appeared on television this afternoon to refute Waheed. ‘How would he know? He was not there.’ Waheed spent the night of the worst crisis in recent Maldivian history hiding inside the official residence while his wife Ilham dolled herself up for the presidential oath taking ceremony planned for later in the day. Without Waheed, the coup-makers would not have been able to legitimise their illegal overthrow of the first democratically elected government of the Maldives, of which he was the Vice President. Without Waheed, the traitors would not have been able to hold on to power for 21 months, and without Waheed as a fig leaf, they would not have been able to drain public coffers of all money, renege on international agreements, destroy Maldives’ relations with the international community and allow Adhaalath Party’s Islamists to gain such traction in our socio-political affairs. ‘I will have to consider what the atmosphere is like in Maldives’, he told Haveeru yesterday when asked if he plans to return. Waheed has a reputation for fleeing—when things got tough back in the 1990s when he was an MP, he ran off abroad for a job in the United Nations. He has boasted that he provided education for millions of women in Afghanistan where he was posted there after the American invasion. In the lead up to these presidential elections, he was asked on TVM’s RiyaaC programme if he would stay or flee should he lose. ‘I will stay,’ he lied. Waheed is one of the biggest traitors in the history of the Maldives. He is also one of its biggest cowards. Once DRP declared its support for Mohamed Nasheed in the election and gave MDP a majority say in the People’s Majlis, it has been under constant attack from the remaining two branches of state power. In the last two months, Members have been arrested & stripped of seats through political exploitation of the judiciary, and government aligned MPs have not just obstructed proceedings but caused physical harm to fellow MPs and vandalised expensive property inside the chambers. With no protection on offer from existing State security services, the Majlis has opted to have its own security, and for the first time, created the post of Sergeant at Arms tasked with securing the Majlis and its Members. The man they chose, with 56 votes out of 57, is former First Lieutenant of the Maldives National Defence Force (MNDF), Mohamed Haleem—Bond Haleem to friends. Haleem turned forty on 29 September. That night he watched MP Ali Azim being brutally arrested. ‘Eye witnesses say that police kicked him and hit him with batons prior to dragging him to their vehicle,’ Minivan News reported. On 30 September he resigned from the MNDF. ‘I realised I just could not go on. There was just too much going wrong.’ Haleem is polite, a humble man. Talking about his resignation seems a difficult thing for him to do. ‘My whole life is the military. Sifainge is my home.’ He joined in 1989. The strong nationalist rhetoric which followed the 1988, 3 November coup got to him. He was sixteen. ‘It was difficult to leave.’ But he felt compelled to. ‘Things were happening that I cannot agree with,’ Haleem said. He found it frustrating to watch security forces being used to stop peaceful demonstrations and felt it was unacceptable that MNDF just stood by and watched as the Constitution was being ripped apart. On 23 September, he registered his dissatisfaction with the Chief of Defence Major General Ahmed Shiyam. It is important, he said in an SMS to the Chief, that everybody is told of what articles 88, 111, 155 and 268 of the Constitution says. They are related to the election, transfer of power, and the superiority of the Constitution over all institutions and laws. Major General Shiyam never replied. After 23 years and 10 months of service, Haleem set about joining civilian life. He registered a company, Bond Investment Maldives. His plan was to take an MVR200,000 contract to do the engineering work on a floating restaurant project. Haleem is an electrical engineer with a Master’s degree in the subject and plenty of experience. He was at his desk working on the project when he heard the Sergeant at Arms job being announced on the radio. The Majlis announcement on 25 October, gave very little time for action. Applications had to be in by 12:00 on 27 October. The beleaguered Majlis was taking no chances. Even though Haleem was unfamiliar with what the position of Sergeant at Arms entailed, the salary (MVR32,000) caught his attention. He Googled the term—‘it was exactly what I was looking for.’ He had been concerned about lack of security and protection the State security services were providing the Majlis with, and now he had the opportunity to lead the effort to protect MPs. Most importantly for Haleem, he would be working to uphold the Constitution. He went to the Majlis premises immediately. It was a Friday, but he located a staff member who gave him a copy of the application form. Everything happened so fortuitously, Haleem thinks there was a higher force at work. ‘It really is a miracle. I wanted to remain steadfast in serving the country, and now, I have the chance to do so again.’ There is a catch in his voice when he talks of the MNDF. ‘I have known no other life.’ Despite the emotion, Haleem seems far from soft. ‘I will ensure that MPs get the protection they need as they perform the important function of upholding the Constitution,’ he says with determination. As Sergeant at Arms, he will be stationed inside Majlis chambers whenever it is in session. If the Speaker calls an unruly member to order three times without being obeyed, the Speaker may gesture to the Sergeant to have the Member removed from the chamber. Haleem will signal members of his staff and, together with them, will proceed in formation to the member’s seat and have him removed from the chamber. It would be done with minimum of fuss, with least possible disturbance to the session. Minister of Defence Mohamed Nazim, was not pleased with Majlis’ plans to have its own security. Citing Article 105 of the Constitution, he asserted that only State security services has the authority to protect the Majlis. The post is common in former colonies of Great Britain, from where it originated. The United States Canada, Australia, New Zealand, South Africa, are all countries where State legislatures have their own Sergeant at Arms. Dhivehi Sitee ©2019. Dhivehi Sitee is not responsible for content of external websites.